Tastes and appreciation of many things change with the season. The kind of clothes you wear, the food you drink, your choice of wine is often influenced by the cycles of nature. Velas understands this. They make triple-scented hand poured Australian candles with a range for the season, to pick you up and transform your day with a sensual aroma. 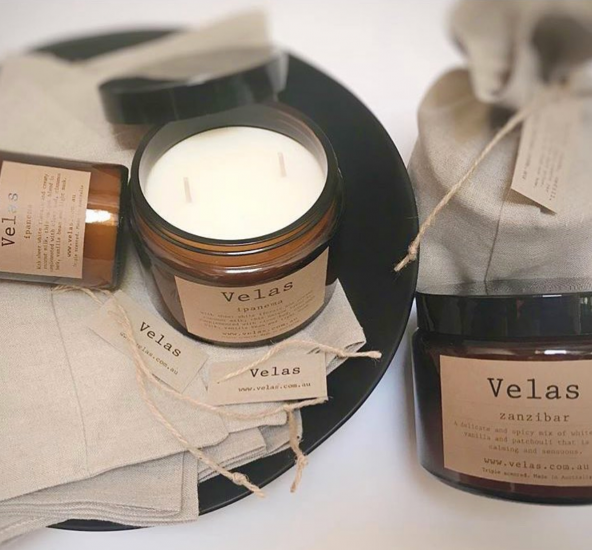 Velas’ large candles have up to 70 hours of burning time and are made using oils that are IFRA approved and phthalate free. $1 is donated to the RSPCA with every purchase. PrintTogether has made business cards, swing tags and stickers for Velas products using 100% recycled 320gsm Kraft paper and 105gsm Kraft adhesive labels. Kraft is a wonderful paper for products that gives a raw, natural look and textured feel. And it looks great printed with dark colours. Tastes may fluctuate, but our attention to quality – and that of Velas candles – is constant. Save 15% on Kraft cards throughout February 2019. Enter discount code 'Kraft' during checkout.